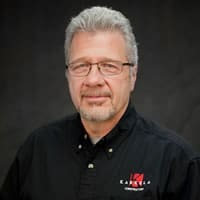 Pat Arnold, Project Manager, Karkela Construction | Karkela Construction, Inc.
Pat joined the Karkela Construction team in 1986. His experience in the construction industry is extensive and spans over 40 years. With more than 25 years on the Karkela team, Pat has managed many successful projects including a large liquor store/deli (23,000 square feet), a highly technical analytical laboratory, and hundreds of dental/healthcare clinics. From ground-up projects to extensive interior remodeling projects, Pat assists customers with their needs for their particular building project and answers any questions that may arise during the planning stages. Prior to joining Karkela, Pat began his career as a laborer for the bricklayers union and he transitioned into carpentry as an apprentice carpenter. Pat also owned a successful commercial and residential building company. Pat’s had experience with a wide range of commercial and residential projects prior to joining the Karkela team. "Karkela made every effort to deliver on promise of cost and quality. Nobody knows dental clinic construction better than them."